These days, outdoor kitchens are more versatile than ever, with a number of design options. Decide whether you want an open, fully enclosed or partially enclosed outdoor kitchen. With an open- air concept you can build the kitchen assembly onto the already existing patio or deck or configure a courtyard within the backyard. Partially enclosed options can be a screened-in patio or deck top pavilion with wide open views using large windows, skylights or retractable awnings. Pergolas using a wall on one side of the house with wood beams are most popular. L-shaped, U-shaped or floating depends on the location for the power outlets, ventilation systems, if required and drains for your sink if one is included in your layout. 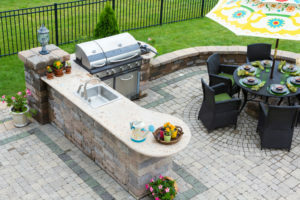 The right layout and concept are key elements to designing the perfect outdoor kitchen. There are two options: prefabricated or customized. There are off- the- rack kitchen assemblies that you can choose from a grill and several cabinets up to an all-inclusive food preparation station. Thee units are stainless steel and can be built in stone or brick surrounds. In a custom built kitchen, you can have cabinets that look like wood and upscale appliances such as terracotta pizza oven, ice maker or warming drawer. You can create a tranquil space with a wood burning fireplace, cozy cushions and fragrant votives. There are countless options. 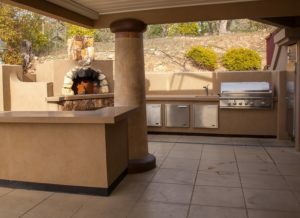 Create your outdoor kitchen. This entry was posted on Monday, July 16th, 2018 at 11:00 am. Both comments and pings are currently closed.